A literature professor unveils the grim secret of a Tuscan villa in Goodman’s florid fifth (The Ghost Orchid, 2006, etc.). Rose Asher, a student in Hudson College’s summer program at villa La Civetta, fell in love with her professor, Bruno Brunelli. Much to her disillusionment, Bruno returned to his pregnant wife. Twenty years later, Rose, now teaching at Hudson, is recruited by Leo, a Hollywood producer, to consult on a movie to be shot on location at La Civetta about Ginevra de Laura, a 16th-century poetess rumored to have been Shakespeare’s Dark Lady. The screenwriter, Robin, falls to his death from a balcony at a college cocktail party. Or was he pushed? Eyewitnesses, including Rose’s current flame Mark (Hudson’s president) and colleague Gene, insist Robin committed suicide when Bruno’s son, exchange student Orlando, enraged by Robin’s theft of his script idea, lunged at him. What exactly plagiarism-prone Robin stole fluctuates throughout: Could it be Ginevra’s long lost poems? Or a letter validating Bruno’s hereditary claim to La Civetta, which threatens Hudson’s hopes of inheriting the villa from absinthe aficionado Cyril Graham? 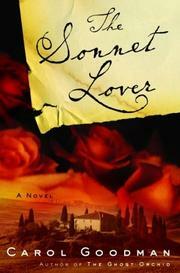 When the Hudson throng reconvenes at La Civetta, Bruno rekindles Rose’s passion, but intrigue soon trumps romance. Inexplicably fearing that bad publicity might hurt the film project, Leo bribes Gene, his shopaholic pillhead wife Mara and Mark to keep the balcony incident quiet. Meanwhile, Rose studies the villa’s pietro dure mosaic floors and their free-form motif of rose petals sprinkled in a path leading from the bridal suite. In the moonlight, these petals resemble drops of blood, symbolizing the defloration of Ginevra by the lord of La Civetta, who decorated the bridal suite with frescos illustrating the wages of thwarted love, including stabbing, disemboweling and…nevermind. Mara trips fatally over ruined steps in the rose garden, and acting student Zoe swallows poison. At the risk of alienating Bruno, Rose must stop Orlando. The richly imagined setting will appeal to Tuscan sun worshippers, but the mystery suffers from lack of a credible murder motive.